The HIV surveillance program plays a vital role in how Florida determines HIV resource needs, program planning and evaluation. The goal is to collect complete and accurate data, and analyze trends in HIV. HIV staff and county partners use these data to plan, carry out and evaluate HIV programs and interventions. Throughout the year, HIV Surveillance staff conduct data validation checks to ensure that cases are not reported twice within Florida or within the CDC’s national database. Duplicate cases identified within the state are merged together as one case. This is important because HIV is a chronic disease and infected people may be tested frequently as a way of monitoring treatment success. Figure 1 (below) depicts a summary of newly diagnosed cases of HIV Infection from the last five years, as of June 30th, 2018. Summary health data are stored in Florida Community Health Assessment Resource Tool Set (Florida CHARTS), the Florida Department of Health’s (FL DOH) database used to track the health status of the state. Health statistics for HIV, AIDS and HIV-related deaths can be found at this web link: http://www.floridacharts.com/charts/CommunicableDiseases/default.aspx. What is the difference between diagnosis and report? Florida tracks HIV/AIDS cases by the year they were diagnosed and by the year they are reported. Year of diagnosis is defined as the year a person is first diagnosed with HIV/AIDS. Year of report reflects the year the patient’s case is first reported to FL DOH and entered into the enhanced HIV/AIDS Reporting System. The year of diagnosis and the year of report may be different for each case because there are specific requirements set by the CDC for when an HIV/AIDS case is considered reportable, even though the person has been diagnosed. There are many criteria that determine whether or not a case is reportable. In December 2015, a patient tested positive for HIV at a local hospital and met the reporting requirements for HIV. The hospital nurse reported the HIV case to the local county health department in January 2016. The new HIV case was entered into the HIV/AIDS Reporting System database in January 2016. In this scenario, the year of diagnosis is 2015 and the year of report is 2016. A person living with HIV moves to Florida in February 2014 and visits a doctor in order to receive care and treatment. The patient reports a history of HIV in Texas. The physician in Florida orders a viral load test on the patient and the result is an undetectable viral load. The patient is currently not reportable because the case does not meet CDC’s case definition for a reportable case. In September 2014, the physician orders another viral load test and the result is a detectable viral load. The case is then reported to the county health department as a new diagnosis for Florida. The case is entered in the HIV/AIDS Reporting System database on October 2014. After surveillance staff follows up on the patient’s report of previous history in Texas, it is determined the patient’s first date of diagnosis is November 2005. In this scenario, the year of report is 2014 and year of diagnosis is 2005. However, once it is determined that the first diagnosis took place in Texas, the patient is no longer part of the Florida diagnosis case count. While it is important to understand the number of new HIV cases in Florida, it is also important to be aware of the overall prevalence, or number of people living with HIV in the state. 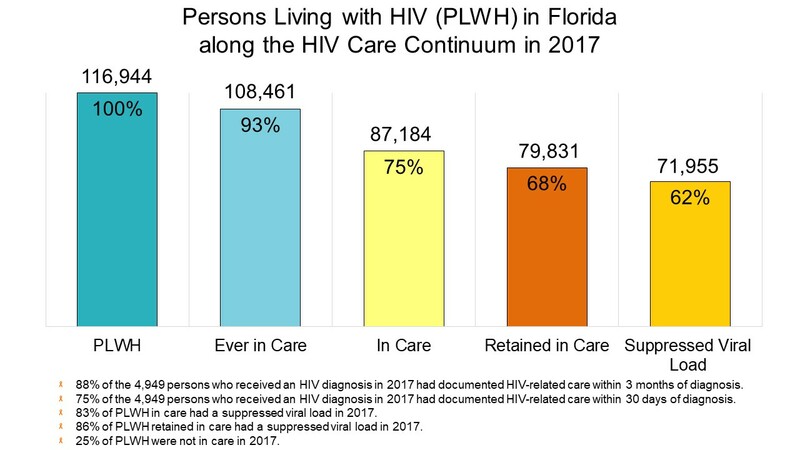 We track these persons because it informs decisions related to resource allocations to ensure all people with HIV in Florida have access to the care they need. Figure 2 presents the levels of HIV Care of the people living with HIV in Florida. This model is updated annually. 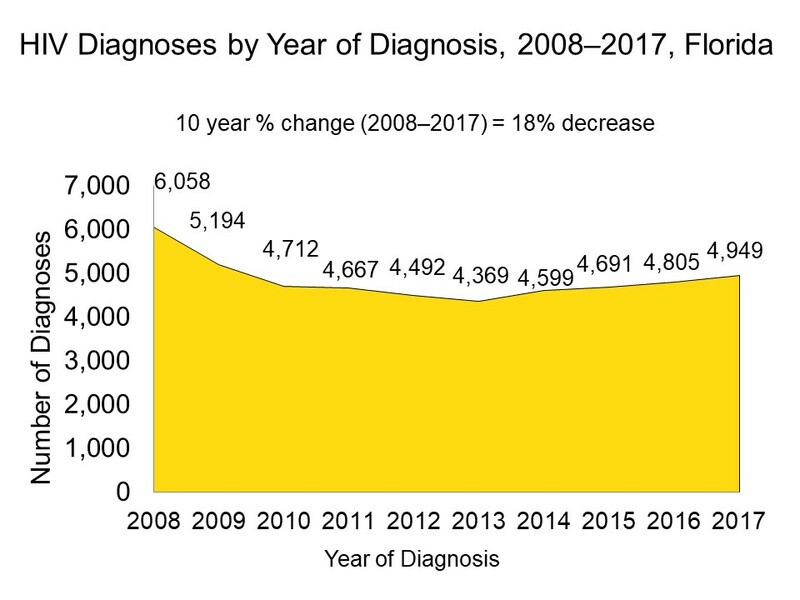 The Diagnosis-Based Model of the HIV care continuum shows each step of the continuum as a percentage of the number of people diagnosed and living with HIV as of the end of 2017. Persons Living with HIV: The number of persons known to be living with an HIV diagnosis (PLWH) at the end of 2017, from data as of 6/30/2018. Ever in Care: PLWH with at least one documented Viral Load (VL) or CD4 lab, medical visit, or prescription from HIV diagnosis through 3/31/2018. In Care: PLWH with at least one documented VL or CD4 lab, medical visit, or prescription from 1/1/2017 through 3/31/2018. Retained in Care: PLWH with two or more documented VL or CD4 labs, medical visits, or prescriptions at least three months apart from 1/1/2017 through 6/30/2018. Suppressed Viral Load: PLWH with a suppressed VL (<200 copies/mL) on the last VL from 1/1/2017 through 3/31/2018.